After almost nine months of preparation, most parents feel prepared to welcome a new child into the family. But when the new child is a second or third child, how do parents prepare the soon to be older siblings? Make them friends before birth. Help your older child get acquainted with the new baby before birth by showing sonogram pictures of how the baby is growing. Let your child pat your belly, feel the new baby kick, and talk to the baby. Tell your older child stories about when you were expecting her, show her pictures of what she looked like right after she was born, after coming home from the hospital, and throughout her first year so she knows what to expect once the new baby comes. Read books about the role of older sibling. There are several children’s books about this specific topic like Joanna Cole’s books, I’m a Big Sister and I’m a Big Brother. These books and others like them positively discuss the joys and challenges with the birth of a new sibling. These kinds of books can open conversations discussing your child’s feelings about having a new baby brother or sister. Give the older child a job. Depending on the age of an older sibling, he or she may be able to help by varying degrees with the addition of a new child. 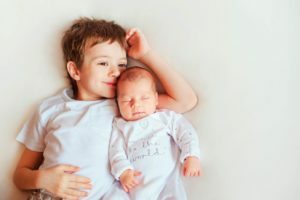 Special tasks like “reading” to the new baby, singing a song, choosing an outfit, or finding a missing pacifier may be just the thing to allow the older sibling to feel helpful. Remind your child of what has not changed. You still love him, and you always will. Your family is growing, but that only means there is more love to go around. Try to keep routines and family schedules the same as much as possible to provide stability for your child. At Stepping Stone School, we will work alongside you to support you and your family through this time of transition.